Four types of Spanish chorizo, clockwise from upper left, soft, semi-cured; sliced hard-cured; loop of hard-cured chistorra, and sliced, hard-cured ibérico. In the recipe for Lentil Pot with Chorizo that I posted in last week’s blog (recipe is here), I specified “4 ounces soft, cooking chorizo.” But I didn’t tell you what “soft, cooking chorizo” is. So, for those of you who are initiates into the world of Spanish charcutería, here is the intro course in Chorizo. 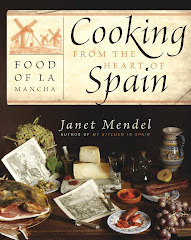 Chorizo is Spain’s most emblematic sausage. It’s made from chopped or minced pork meat and fat, sometimes with beef as well, macerated with sweet and hot pimentón (paprika) or the pulp from choricero peppers, plus pepper, garlic and oregano. The pimentón gives chorizo its distinctive ruddy-red color. The sausage also acquires a subtle smoky flavor from the use of smoked pimentón, pimentón de la Vera. After stuffing in casings, the sausages are air-dried. Lactic fermentation gives chorizo an appetizing tangy flavor. There are actually two types of chorizo, soft and hard, although, if you are shopping for ingredients outside of Spain, you may find only the hard variety. “Soft” chorizo is tied off into short links, en ristra. It has more fat content than hard chorizo and is semi-cured. Although soft chorizo can be consumed without cooking, it is best when added to stews, such as that aforementioned Lentil Pot; grilled (over charcoal or on a grill pan), or fried (super with a pair of eggs fried in chorizo fat). Dry-cured, hard chorizo, while it can be used in cooking too, is meant to be served sliced as a cold cut. The mixture of pork and fat is very compacted, giving a texture somewhat like salami. 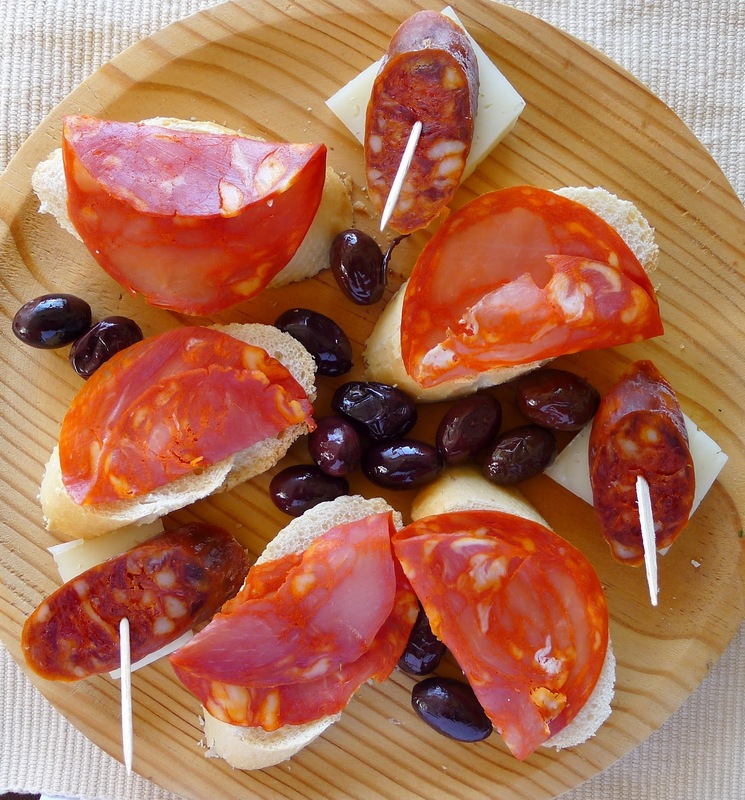 Served with bread, sliced hard chorizo is a delicious tapa or snack. Hard chorizo comes in several shapes, such as thick rolls, cular, or thinner “candle” ones, vela. Pamplona chorizo is a version that is more finely chopped. Chistorra is a skinny loop of Pamplona-type chorizo. Chorizo from Asturias, in northern Spain, is smoke-dried. When chorizo is made from the meat of ibérico breed of pigs, it is labeled Ibérico and is considerably more expensive than chorizo made from ordinary pigs. 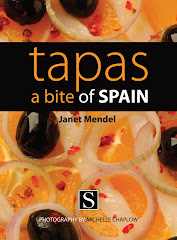 There is also chorizo made from jabalí, wild boar. Mexican chorizo differs totally from Spanish chorizo. Mexican chorizo, usually highly spiced, is a fresh sausage and must be cooked before eating. Jeffrey Weiss is someone who’s doing the graduate degree in chorizo. An American chef from California, he worked as an intern in some of Spain’s top restaurants. 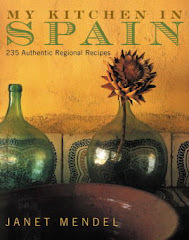 His year in Spain included a stint at a traditional matanza, pig slaughtering and chorizo making. "Chorizo,” says Jeffrey, “is the reason the pig was invented.” Jeffrey, who is writing a book about Spain’s contribution to sausage glory, Charcutería: The Soul of Spain, points out that in the United States, “we have little or no access to the variety of tubular-encased awesomeness that a typical Spaniard does. Our import laws are too stringent to let in the really good stuff (outside of José Andrés's relatively-expensive Fermin line). A few nationally-based producers are making their versions: Fra'Mani makes a great chorizo, as does Armandino Batali at Salumi in Seattle and Olympic Provisions in Portland. "Until now, the spectrum of deliciously-porky, regionally-unique, cured meat traditions has yet to enter the melting pot of modern American gastronomy. That’s why I’m writing the book on the subject." Drain the beans and put them in a pot with water to cover, bay leaf, and salt. Bring to a boil, skim, then simmer, covered, until beans are tender, 1 to 2 hours. Drain the beans and place in a bowl. Add the parsley, oregano, cumin seeds, onion, pepper, chorizo, oil, and vinegar. Add salt and pepper to taste and combine well. Cover and refrigerate for at least two hours or up to 24 hours. Allow to stand at room temperature 30 minutes. Place the beans on a platter. Garnish with olives, quartered eggs, lettuce leaves, and radishes. A beautiful salad and an outstanding photograph. I would have to say that I like chorizo more than jamón but don't make me choose between one or the other. I always have both on hand. I really miss going to Salumi in Seattle. The first time I went I had no idea that Mario Batali's parents ran the joint. I saw one of his cookbooks on the counter and I said, "I love that guy's show." I'm just glad Gordon Ramsey's parents don't run it because that guy I can definitely live without (and his food is atrocious). Leftbanker: Thanks for the compliment about my photo. I'm getting to know my new camera. 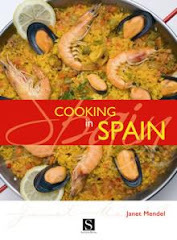 Seattle also has The Spanish Table, where you can find just about everything you need to cook Spanish. Ooh, my suegros make their own chorizo and it's delicious. However, they also make their own salchichon, which is my favorite. Now I'm salivating. 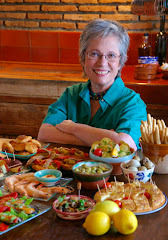 Also, that salad looks amazing and oh-so-Spanish. Kaley: Do the suegros make sausages commercially? How wonderful to have home-made chorizo in the family! Despana Brand Foods in NYC also makes great chorizo. 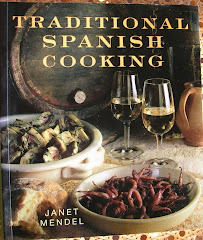 We had some of their chistorra warmed in my fireplace the other night with a glass of cava -- perfect! Donna: That does sound good!